Click to enlarge. Hat tip to Kevin Drum. Gov. Ralph Northam of Virginia had a page in his 1984 college yearbook showing a white man in blackface (possibly Northam himself) posing with someone in Ku Klux Klan regalia. This has been big news, and many of Northam’s fellow Democrats have called on him to resign. Gov. Brian Kemp of Georgia, when serving as secretary of state, purged Georgia’s voter rolls using methods that targeted black voters. This may have given him his margin of victory over Stacey Abrams, a black woman. This has not been big news, and none of Kemp’s fellow Republicans have called on him to resign. This fits with Machiavelli’s observation that human beings will more readily forgive an actual injury than they will an insult. It is good that certain words and actions that once were common are now socially unacceptable. I can remember when what we now call the N-word was a common expression. I’m glad it isn’t any more. Yet Lyndon Johnson, who did more than any President since to advance the cause of civil rights, used that word. And certain powerful people who would never use that word condone redlining, police brutality, selective enforcement of drug laws and systematic disenfranchisement of African-American voters. I don’t think anyone should be judged on the basis of the worst thing they ever said or did, but rather on the basis of the record of their whole adult lives. Gov. Northram has apologized for the yearbook photo. He should have the chance to show by his policies as governor that his apology is sincere. 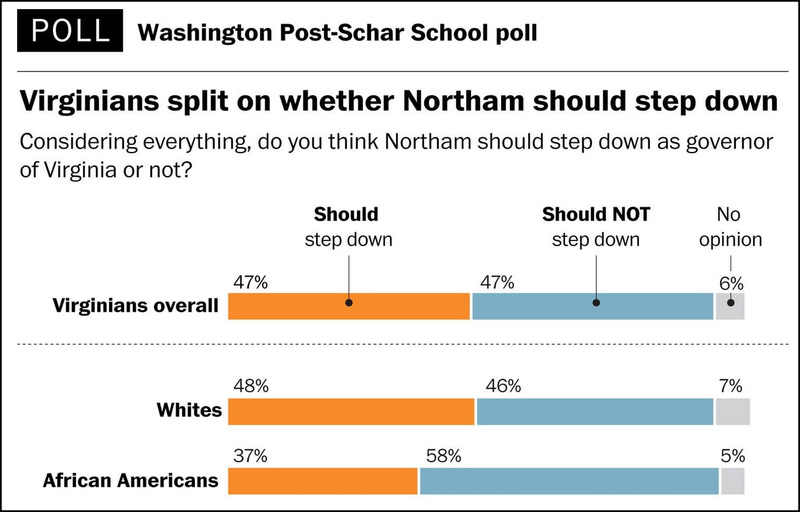 Judging by the results of the public opinion poll shown above, a majority of African-American voters in Virginia feel the same way. Ralph Northram and the limits of forgiveness by Doug Muder for The Weekly Sift, who also made some good points today. Reverend William Barber Explains How Governor Northram Can Repent His Racist Sins. Establishment Republicans mystified by their base should look at Ed Gillespie’s campaign by Matthew Yglesias for Vox. About Northram’s Republican opponent in the 2017 election. GOP’s Brian Kemp purged 1 in 10 Georgia voters by Greg Palast. And Kemp is not alone, as Palast’s other reporting shows.